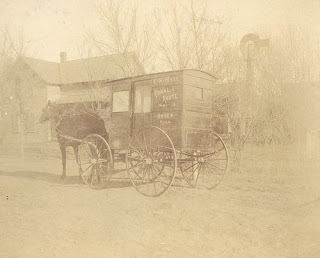 In Minnesota around 1905, this is how the post was delivered. But it was much more than that, effectively a shedworking office on wheels which also carried stamps, stamped envelopes, money orders and other odds and ends to sell as it moved along. Photo from National Postal Museum via the Smithsonian Institution on Flickr.